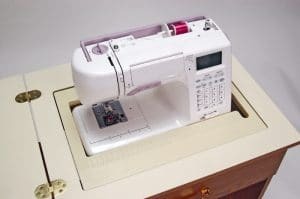 Q: Will my sewing machine fit in the cabinet? 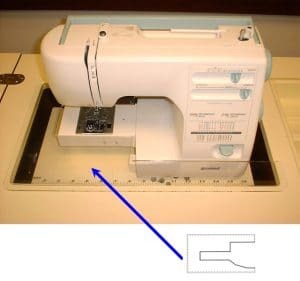 A: Not all sewing machines or embroidery machines do fit, so to make sure review the opening dimensions of the cabinet. Q: Do the cabinets come fully assembled? A: No, they only come RTA (Ready-to-Assemble). But, they are not very difficult to put together! Q: What is a Universal Insert? A: This is a picture of a Universal Insert made to fit most machines. It fits the Sewnatra and Auntie cabinets and is included with those models. Q: What is a Custom Machine Insert? A: It is a plexi-glass piece made to fill the gap around your machine. It is custom made to the exact dimensions of the cabinet's opening and your specific sewing machine. The insert is used only in the flatbed position of the cabinet, which is the second or middle position on the airlift. The Custom Machine Insert can be ordered here: https://www.sewingtablesbysara.com/custom-insert/. Q: How do I adjust the Arrow airlift mechanism? A: We have a video demonstrating the use of the airlift mechanism which you can view below. Q: How do I adjust the Kangaroo airlift mechanism? A: We have a video demonstrating the use of the Kangaroo airlift mechanism which you can view below. Q: How do I care for my cabinet? A: We're glad you asked. Please take a look at this helpful video showing recommended methods for cleaning your Arrow and Kangaroo cabinets. Q: Does my airlift need maintenance? A: Yes we cover the maintenance steps for your airlift in the following video. In addition, the video covers solutions to other airlift problems you may encounter. Q: Where are your Arrow cabinets made? A: Our Arrow cabinets are no longer made in the United States, they are currently made overseas. Arrow's headquarters is located in Delavan, WI and employs 50 people. All product is warehoused and shipped from our facility in Wisconsin where our customer service, sales and marketing teams are located. Q: Are your Kangaroo Kabinets made in Australia? A: Parts of our kabinets are made in Australia, but the majority of the components are made in China. All concepts and original designs originated "down under", thus our boxes are labeled "Made in China, born in Australia". Q: What are your cabinets made of? A: Our cabinets are made of a combination of MDF (medium density fiberboard) and particle board with a laminate or melamine finish. Q: What is the warranty on your Arrow Products? Thank you for your purchase of an Arrow Sewing Cabinet or other Arrow product! Our products purchased as of January 1, 2012 now have a three- year warranty from the date of shipment from our facility that covers manufacturer’s defects and a 15-day warranty for any shipping damages. Your manual may not be updated to reflect this new three-year warranty, please disregard the one-year date listed on the manual. The warranty does not cover freight charges for any defects noticed after the first year of use. Arrow will replace parts for manufacturers defects, but freight for these parts will be the responsibility of the customer requesting parts after the first year of ownership. The warranty also does not cover damage caused by abuse, mis-use, alteration, poor assembly, accident or neglect of the product. The warranty does not cover damage as a result of moving the cabinet fully loaded or damage caused by moving the cabinet with locked casters. Under the terms of this warranty the repair and replacement of any parts shall be at the discretion of the company or their designated representatives. To help protect our valuable resources, we ship all replacement parts out at the same time. This procedure lessens the use of packaging materials and fossil fuel used in transportation in order to reduce pollution. Please help us in this endeavor by reviewing ALL parts in ALL boxes for damage before calling or e-mailing us to report damage. We adhere to our environmental philosophy by only shipping replacement parts out 1 time for free within the first year of ownership. Future parts request will be billed at the customer’s expense. Q: What is the warranty on your Kangaroo Kabinets Products? G-day mate! We warranty our product for 5 year from date of shipment for manufacturer’s defects or shipping damage within the first 15 days. The warranty does not cover damage caused by abuse, mis-use, alteration, accident, or neglect of the product. The warranty does not cover damage caused by moving the cabinet fully loaded. Under the terms of this warranty the repair and replacement of any parts shall be at the discretion of the company or their designated representative. To help protect our valuable resources, we ship all replacement parts out at the same time. Replacement parts are shipped free of charge only during the first year. This procedure lessens the use of packaging materials and fossil fuels used in transportation keeping our world for all kangaroos and the people like you a cleaner place. Please help us in this endeavor by reviewing all parts in all boxes for damage before calling or e-mailing us to report damage. We adhere to our environmental philosophy by only shipping replacement parts out 1 time for free. Additional parts requests will be billed at the customer’s expense. To remove marks and enhance the surface, wipe over with a general purpose cleaner. Do not use ammonia based cleaning agents. Do not use harsh chemicals or abrasive cleaners. The surface can be wiped with a damp cloth but should be dried quickly.